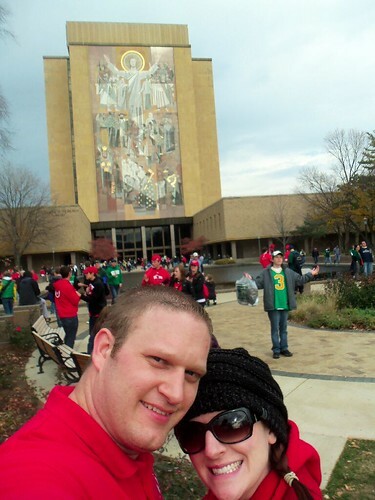 the one where we hang out with touchdown Jesus. 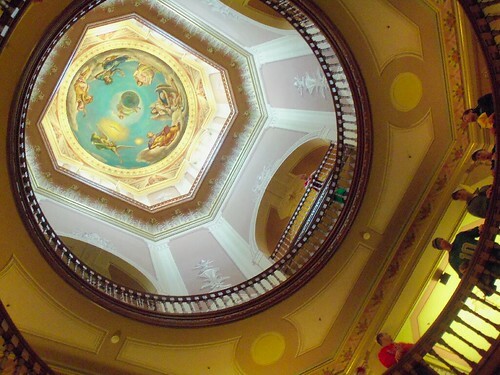 I’ll admit that I was picturing your campus to be far more Hogwarts-y and far less…college campus. I blame Disney for some reason. Regardless, it was pretty. Nice and old and well maintained. Lots of traditions at your school, it’s impressive. I even stood in line for 45 minutes for a supposed legendary steak sandwich. It was pretty good. The money went to charity, so that knocked it up a few notches. Also? 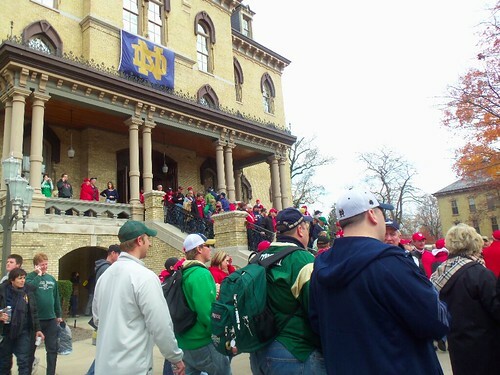 Notre Dame fans are kind of like BYU fans that drink. I’m pretty sure the entire liquor store inventory was in the tailgate lot. Sure, there were a lot of Utah fans. But once we got inside the stadium and realized our tickets weren’t in the Utah section? There weren’t many Utah fans. At all. 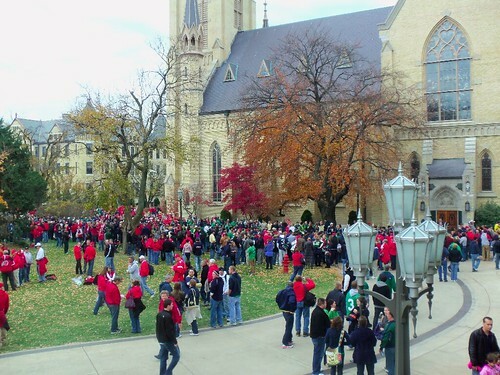 And Notre Dame fans have a whole strength in numbers thing. They were really nice. Until y’all started gently roasting our team. By the time you had kicked our proverbial butts…you got really cocky. It’s cool. I’d like to assume your cockiness came from regard for how awesome we are (well, were.) TCU kind of did us in last week. We may never be the same. You know who else will never be the same? Cody. He’s a sad, sad guy. We haven’t been to a game where Utah had lost since 2003. It hurt. Not going to lie. But seeing how excited you were after winning? It was kind of cute. You rushed the field like you had just won a championship game. But really you had just won the fifth game of your season. Bringing your win/loss percentage to 50%. But yay for your celebration! YAY FOR YOU! Thanks for accommodating us, and only making minimal jabs and jokes at our dismal loss. As a Utah transplant to Indiana? I totally get how a bunch of high mountain desert dwellers can choke when placed in dismal rainy Indiana weather. I didn’t dry out from three hours in the cold rain until this morning. And I was wearing a plastic bag the whole time. See you next time, that is if Cody ever recovers. You probably passed by my house on the way and didn’t even stop!? Ok I forgive you. @Adventures In Babywearing, Maybe? Believe me, I was too tired and grumpy to be any fun. Poor Notre Dame got grumpy Casey. 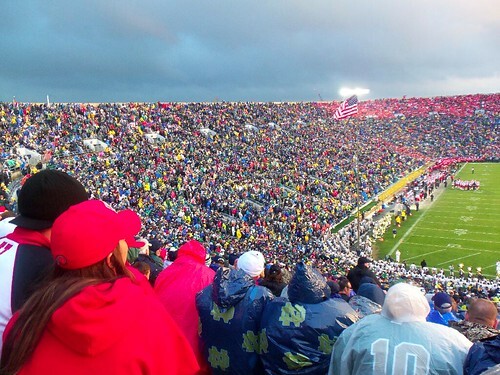 @Casey, The ONE time I’ve ever been to Notre Dame was to see a Purdue football game & I was pregnant and VERY grumpy in uncomfortable boots with heels. I get you! I was definitely worried that the steak sammich wouldn’t be a hit with the pregnant lady… I can’t believe the line was 45 minutes. CRAZY! 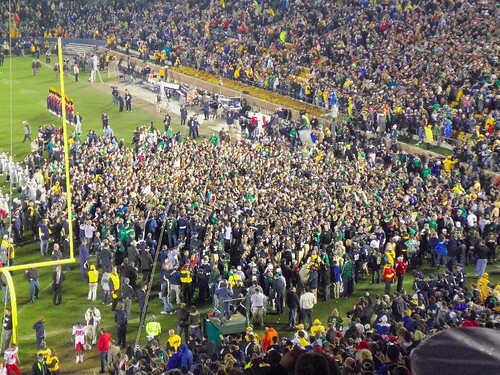 And I swear that only ND students can celebrate the heck out of winning their fifth game. It’s been a rough few years for ND football. And by few I mean at least 5..
@ClassyFabSarah, It was good! It was just the line…for meat…on a bun. I liked your tweet about the second coming…made me giggle when we finally got home. Hey you WERE there! Cort commented about it while the game was on that he thought you and Cody were there! Glad you had fun even though Utah lost (stupid ND)! I’m glad you had fun, even if the game didn’t turn out quite how you wanted it to. I’m always interested to see my thoroughly beloved campus through the eyes of a visitor, and it’s good to hear the fans didn’t give you too hard of a time My husband and I were watching on tv (both of us are graduates, and we even got married at the basilica there on campus…and then we moved far, far away to Georgia because Indiana weather leaves a little something to be desired…), and as the students rushed the field, all we could do was shake our heads and laugh…I guess given the team’s recent history, we’ll take what we can get! @Tara, All the stoplights in Kokomo gave us plenty of time to argue over where to eat at 9 pm when we were both grumpy, hungry and cold. Silver lining! I was there too! (But I am an ND fan :). I am glad you had a pleasant time despite the dismal South Bend weather (however, this time of year, we were lucky it wasn’t snowing up here!). And it is true… ND has had a pretty sad run… so when we beat a ranked team, we get pretty excited. 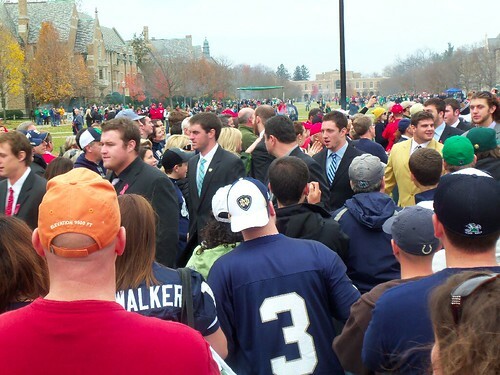 Plus it was Senior week – last home game for all of the ND seniors. So the kids get emotional :). @Maura B, I can assure you in my quarter decade living in Utah the weather was never ever like that. Ever. Living in Indy for four years now it’s no big surprise. Glad you had a good time in South Bend. We went up there once for the BYU game (5 years ago, it seems like yesterday). It was a good time. awesome post…sorry YOUR team didn’t win. I thought the same of winning a championship celebrations…but they sure looked like they were having fun. Poor Utes, I didn’t make the drive to South Bend, but I cried none-the-less. I too love the campus. We moved here 4 years ago and can get there in about 45 minutes. I didn’t imagine it to be Hogwartzy, but having just been in Europe I was hoping for a mini cathedral. AND I couldn’t stop saying Notruh Dohm instead of Nodre Dame. So embarrassing. I swear it was reflexive. Sorry about them losing while you sat on those uncomfortable seats, and hooray for that sammich! I woulda let you sulk around our backyard fire with some cocoa before you drove all that way back. Hope you’re better now! @JourneyBeyondSurvival, I’m not sure those bleachers could have been any more uncomfortable! Did you happen to stop in at the bookstore? I was working there that day and was wondering if you two were coming to the game. @antonette, We didn’t. Between the time spent in the Library (warm!) and the steak sandwich line I was pretty much spent on the tourism. YOU WERE ON MY CAMPUS AND I DIDN’T KNOW ABOUT IT!?!? @Ann, As long as we can beat THEM. Sheesh.